As your EMC CLARiiON, VNX, and AX series grow older, sourcing the exact part number replacements for hard drives can get harder and harder. This guide attempts to help you on how to determine the part number and see compatible part numbers for your system. There is a good chance that there are many part numbers listed on a single drive pulled from an EMC array. The generic EMC Model Number does not appear on a drive (e.g. EMC CX-SA07-010 1TB SATA Hard Drive). 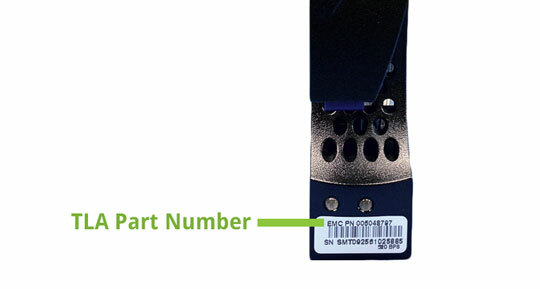 The disk part number (PN) appears on a label on the front of the disk carrier. This is a nine digit Top Level Assembly (TLA) Part Number like PN 005123456. There are several TLA part numbers that fall under the same EMC model number. Example: Your hard drive has a TLA Part number reading 005048797. Your replacement has a TLA part number 005049070. These are both the same EMC hard drive model number CX-SA07-010 and are hot-swappable.